Stone Temple Pilots reunited with singer Chester Bennington of Linkin Park on Saturday for a one-off performance at From Classic To Rock, a charity concert to benefit public schools in Rancho Palos Verdes, California. The show at the Norris Theater and Pavilion mixed rockers with world-renowned classical musicians to take the audience on a journey from 17th century to today’s modern hits, with proceeds to be donated to the Peninsula Education Foundation (PEF). In addition to STP, other performers included Gary Wright (“Dream Weaver”), Yutong (Pacific Symphony, LA Phil, Hollywood Bowl Orchestra), Chas West (Bonham, Foreigner), Marten Andersson (Lizzy Borden, George Lynch), Monte Pittman (Madonna, Solo Artist), Stan Sharp (Long Beach Symphony, Hollywood Bowl Orchestra) and Jane Lee (accomplished pianist). A charity auction at the event included signed items from Slash, KISS, Def Leppard, Peter Frampton, Foo Fighters, The Doors and Joe Walsh, among others. All musicians involved with From Classic To Rock contributed their time, energy and musical talents in an effort to benefit public education by helping fund programming supported by PEF including school music, physical education, library and STEM programs, safe school counselors, academic and career counselors, and teacher salaries. After teaming up with STP in 2013, Bennington announced his departure from the lineup last fall as he struggled to juggle his work with the group alongside his Linkin Park and personal obligations. 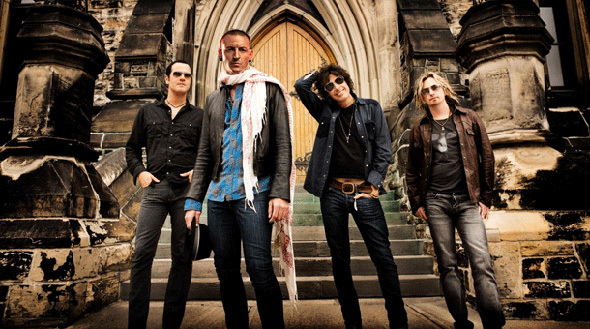 Earlier this month, Stone Temple Pilots closed online auditions for a new singer.